Exercise is a vital part of living a healthy lifestyle, because it has so many benefits. Everyone can benefit from exercising. With just 30 minutes of exercise a day, physical and mental health can be drastically improved, especially when combined with healthy eating. The goal is to be as active as possible by increasing the amount of movement each day. Carry your groceries. Make extra trips to carry each bag into your home. Park your car in the farthest spot from the entrance. Skip the drive-thru and walk into the bank, dry cleaners or pharmacy. Take a scenic walk through a zoo, park or museum. Walk in place, do squats or lift weights during commercial breaks. Pace around the house when talking on the phone. Take your dog for a walk, or play with your cat. Tend to your garden - pull weeds, rake leaves and plant flowers. 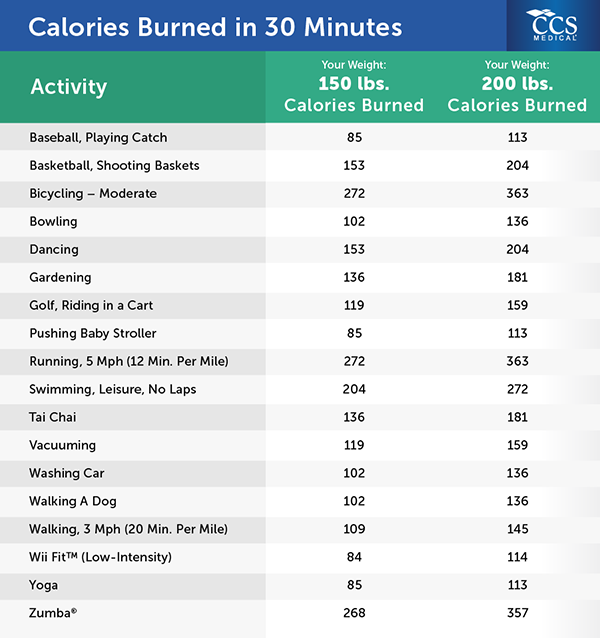 Calories Burned in 30 Minutes Reference the chart below to know how many calories you can burn for 30 minutes of exercise, depending on the activity. There are four types of exercise - Endurance, Strength, Flexibility and Balance. Each type has its own specific health benefits. 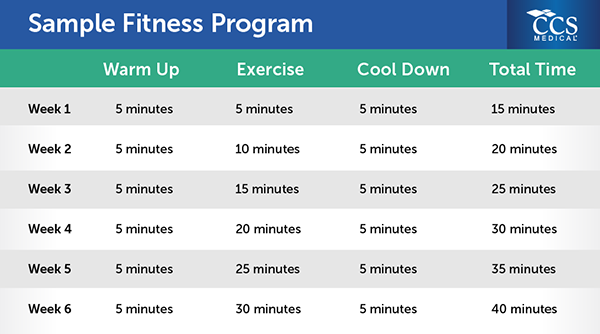 By including all four types in an exercise routine, you will receive the benefits each type offers, avoid boredom and lower your risk of injury. Before starting any exercise program, it is important to talk with your doctor. Once you are approved to start exercising, follow these steps for a successful exercise program: 1. Set realistic goals. 2. Start your program slowly. If you are not used to exercising, start with 15 minutes of activity and increase it by 5 minutes each week. 3. Keep an exercise log. 4. Try different activities and find ones you enjoy. 5. Incorporate different types of exercise in your routine. 6. Always start with a warm-up and end with a cool-down and stretching. 7. Keep going! Do not get discouraged. If you miss some days, return to your routine as soon as possible. For people with mobility challenges, exercise is very important, because it helps strengthen muscles and improve balance. Try to exercise at least 150 minutes a week. Choose exercises with a minimal risk of falling and injuries. Start slowly with small intervals and light pound weights, and increase as able. Try the exercises listed below, courtesy of the National Institute on Aging.